Yes, some people are insisting that Black Panther is really Black – in aesthetic, not just ethnicity. And yes, this is the first time so many Black people have been seen looking fabulous and doing fabulously well in a shiny world that stretches the limits of our imaginations. But that’s not the only reason so many are SO EXCITED about the movie. Let’s face it: we need heroes. Few people have embodied our rage and commanded our respect like Colin Kaepernick. This brother put himself all the way out there to take the lightning rod heat. Colin did what superheroes do – he took on the bad guys by himself. If others joined him – great! If not – cool. He was going to speak out against police brutality despite the cost—and the cost was considerable. Emblematic of courage and clear conviction, Colin has no use for a cape or a sonic spear; his Afro and cornrows are the heart on his sleeve. 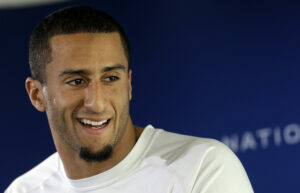 Colin’s money stays up where his mouth is. Remember this? “I will donate one million dollars plus all the proceeds of my jersey sales from the 2016 season to organizations working in oppressed communities, 100K a month for 10 months.” Done. His free Know Your Rights Camp for young people helps to keep kids alive by rehearsing them in the difficult dance that might be their next police encounter. They are also availed of information and resources on higher education and self-empowerment. There was a time when it was not a compliment to be called Auntie – unless, of course, by your niece or nephew. 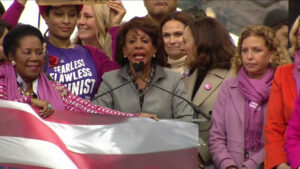 But Congressperson Maxine Waters appears to find it as amusing as she does endearing. Who knew that all her work on – and behind – the scenes, would result in her becoming a household name synonymous with grit and greatness? People wait to hear what Auntie Maxine has to say about an issue, because they know it will be straight-edged. Rep. Waters has gained a reputation, first among her constituents, then throughout the nation, for taking on the villains, be they at a hearing on Capitol Hill, across the table at a televised interview. Her bark is not worse than her bite – it is her bite. She will call anyone out and anything – if it’s not right. Maxine is regularly out on the streets among her constituents, seeking truth through their lived experiences and finding ways to translate that into policy with teeth. Whether it was standing up for Geronimo Pratt and Rodney King, backing former Rep. John Conyers on reparations or voting against the war Iraq, to name just a few of her stances, Rep. Waters found the courage of her convictions. The former chair of the Congressional Black Caucus, Maxine is the senior-woman in Congress. As the ranking member of the House financial Services Committee, she worked with former Rep. Barney Frank to seek a way to bring economic restrictions into play in countering the draconian surveilling of the citizenry by the NSA. She has always faced hard truths with resolve and a touch of humor and she is always welcome where people are need of a champion with a conscience. Amandla Stenberg, an outspoken critic of cultural appropriation, was named Feminist of the Year by Ms. Foundation for Women at the ripe old age of 16. That same year, she was one of Time magazine’s “Most Influential Teens,” a list she’d be included on again in 2016. A child model for Disney at age four and later an accomplished musician and songstress, Stenberg became widely known for her acting. Her first feature film was “Colombiana,” but being cast as Rue in the blockbuster film version of “The Hunger Games” (2012), set racist fans of the novel aflame, creating a media frenzy. When eyes were upon her she sometimes took the opportunity to speak out against injustice. But most often, she was too busy creating art to affect change. In 2015, she co-wrote, along with Samantha Jones, “Niobe: She Is Life,” a comic book featuring a Black teen warrior girl. “Niobe: She Is Death,” the second of a trilogy, was published in 2017. In 2016, Stenberg’s School video project about cultural appropriation went viral when it asked, “What would happen if we loved Black people as much as we love Black culture?” Titled, “Don’t Cash Crop My Cornrows,” the video addressed white celebrities co-opting Black hairstyles, Hip Hop, etc., without respecting — or even grasping, at times — the underlying history and significance. Stenberg works to help get more young women involved in STEM, is a youth ambassador with No Kid Hungry, and supports the Ubuntu Education Fund, of Port Elizabeth, South Africa. She directed the #BlackGirlMagic video series for Teen Vogue and in 2014 directed the short film, The Yellow Wallpaper. She plans to become a professional filmmaker who expands the breadth and reach of roles for Black women. Tarana Burke’s journey on the path of advocacy did not begin when she coined the phrase “Me Too” in 2006. As a child born and raised in Queens, she was nurtured by her parents to know her history and to seek justice. She began working as a teen to improve conditions for other girls and her understanding of the importance of social justice work expanded when she spent summers working in the South. Proud of her work and filled with the urgency to serve and affect change, Burke would accept the mission instilled in her and would run with it. Just Be Inc., which she founded (renamed Me Too in 2008), and Girls for Gender Equity, for which she serves as Senior Director, have shown girls their own bright faces and beautiful minds, passing along the courage to speak out and stand up for themselves and for one another.